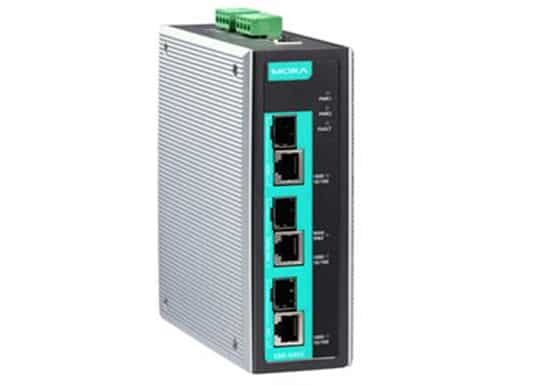 Moxa Ethernet Switches from Allied Automation, Inc.
Moxa manufactures an extensive range of industrial Ethernet switches with features such as industrial-grade reliability, network redundancy, and seamless integrated security at the best price-to-performance ratio. Moxa products include managed, unmanaged, Gigabit Ethernet, PoE, IEC 61850-certified, EN50155-certified, and rack mounting to provide users with best-fit solutions. The EDS-205A & EDS-208A are 5 and 8-port industrial Ethernet switches that support IEEE 802.3 and IEEE 802.3u/x with 10/100M full/half-duplex, MDI/MDI-X auto-sensing. Fiber port switches for SC/ST in single or multimode are available. These switches have redundant power inputs that operate at 9.6 to 60 VDC or 18 to 30 VAC for greater system reliability. Moxa switches have been designed for harsh industrial environments and hazardous locations (Class I Div. 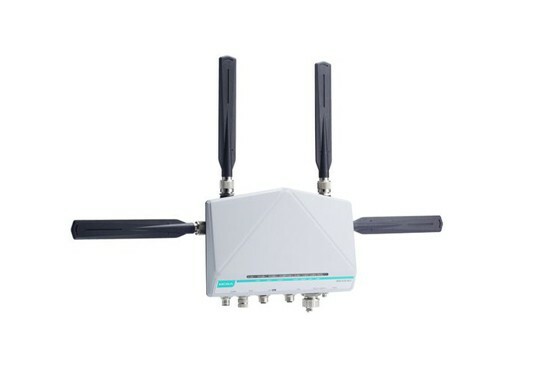 2, ATEX Zone 2) and comply with FCC, UL, and CE standards and backed with a five year warranty. The EDS-205A/208A switches are available with a standard operating temperature range from -10 to 60°C or Extreme Temperature range from -40 to 75°C. All models are subjected to an intensive 100% burn-in test to ensure they fulfill the special needs of industrial automation control applications out of the box and for years to come. Dip switch enabled broadcast storm protection, aluminum house for a more rugged design and sturdy metal DIN rail mount further distance this model from residential and many “industrial” Ethernet switches available, all at a competitive price. 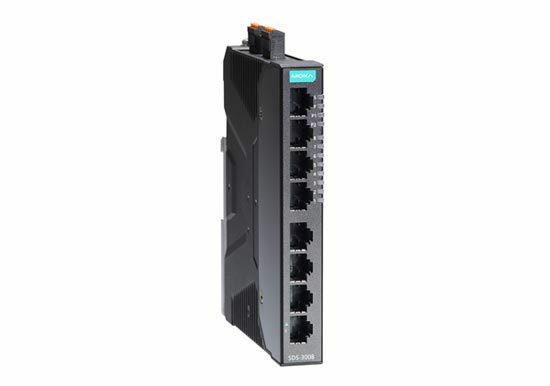 The EDS-G205 / EDSG308 DIN-Rail mounted unmanaged Ethernet switches are equipped with 5/8 Gigabit Ethernet ports and up to 2 fiber optic ports for high demand bandwidth and provide an economical and highly reliable solution for your industrial Gigabit Ethernet connections. The built-in relay warning function alerts network managers when power failures or port breaks occur. The standard model is rated at 0 to 60°C and the extreme temperature “-T” model operates at -40 to 75°C. Both models undergo an intensive 100% burn-in test to ensure they fulfill the special needs of industrial applications out of the box and for years to come. DIN rail mountable with optional wall mount kit and five year warranty. 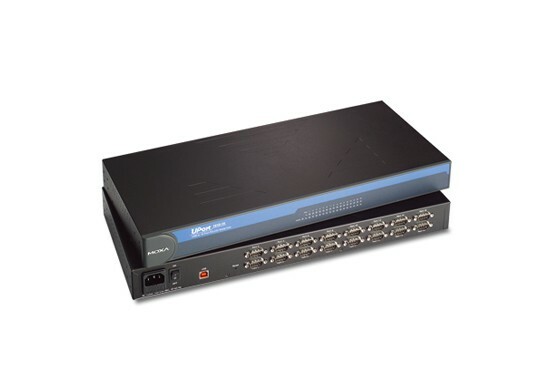 The EDS-305, EDS-308, EDS-309 and EDS-316 are 5, 8, 9, and 16-port unmanaged Ethernet switches that are Moxa’s most robust and advanced unmanaged switches. DIN rail or wall mounted, broadcast storm protection is standard, and many models include fiber optic port interface with SC and ST connectors for Multi-mode or Single-mode. The EDS-300 series features transparent transmission of VLAN tagged packets and built-in relay warning function to alert network engineers when power failures or port breaks occur. The switches are designed for harsh industrial environments and applicable to hazardous locations (Class I, Div. 2 / ATEX Zone 2). The switches comply with FCC, UL, and CE standards, and come in two model types: standard operating temperature range models (0 to 60°C) and extreme temperature models (-40 to 75°C). All models undergo an intensive 100% burn-in test to ensure they fulfill the special needs of industrial applications out of the box and for years to come. Feature a five year warranty. The EDS-405A/408A are entry-level 5 and 8-port managed Ethernet switches designed especially for industrial applications with thick, robust heat sinks and metal body construction. 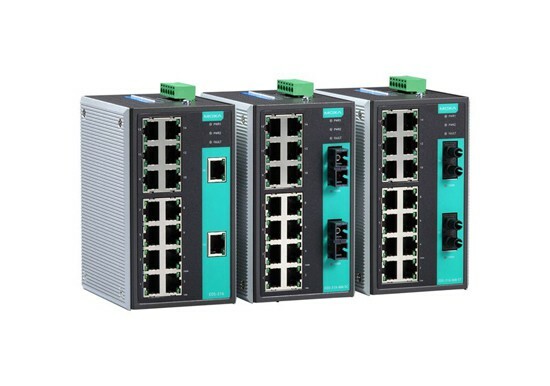 DIN Rail or wall mountable, the switches support a variety of useful management functions such as Turbo Ring, Turbo Chain, ring coupling for exceptional reliability and industry leading self-recovery times for large networks, port-based VLAN, QoS, RMON, bandwidth management, port mirroring, IGMP snooping, and warning by email or relay. The ready-to-use Turbo Ring can be set up easily using the web-based management interface, or with the DIP switches located on the top panel of the EDS-405A/408A switches. Intensive 100% burn-in tested. Five year warranty. The EDS-505A, EDS-508A, EDS-516A are standalone 5/8/16-port managed industrial Ethernet switches. With their advanced Turbo Ring and Turbo Chain technology (Recovery time < 20 ms for hundreds of nodes) and RSTP/STP (IEEE 802.1w/D), the EDS-516A switches increase the reliability and availability of your industrial Ethernet network. Models with a wide operating temperature range of -40 to 75°C are available. EDS-500 switches support several reliable and intelligent functions, including IEEE 1588 PTPv2, Modbus/TCP, LLDP, SNMP Inform, QoS, IGMP snooping, port locking, automatic warning by exception through e-mail, relay output, support EtherNet/IP. 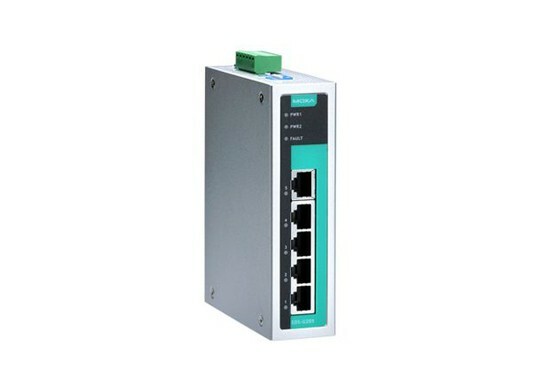 PROFINET and Modbus/TCP protocols, VLAN, IEEE 802.1X, HTTPS, SNMPv3, and SSH, make the EDS-5 series of switches suitable for any harsh industrial environment. The SDS-3008 smart Ethernet switch is the ideal product for IA engineers and automation machine builders to make their networks compatible with the vision of Industry 4.0. By breathing life into machines and control cabinets, the smart switch simplifies daily tasks with its easy configuration and easy installation. 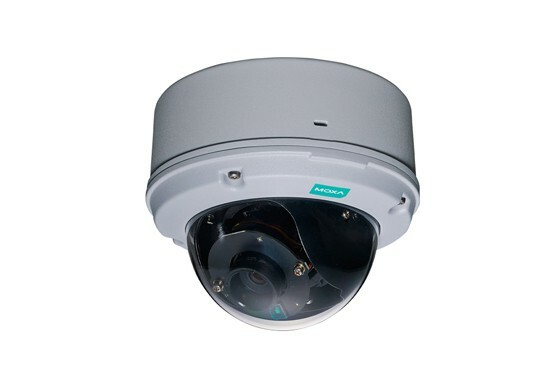 In addition, it is monitorable and is easy to maintain throughout the entire product life cycle. The most frequently used automation protocols—including EtherNet/IP, PROFINET, and Modbus/TCP—are embedded in the SDS-3008 switch to provide enhanced operational performance and flexibility by making it controllable and visible from automation HMIs. It also supports a range of useful management functions, including IEEE 802.1Q VLAN, port mirroring, SNMP, and warning by relay. 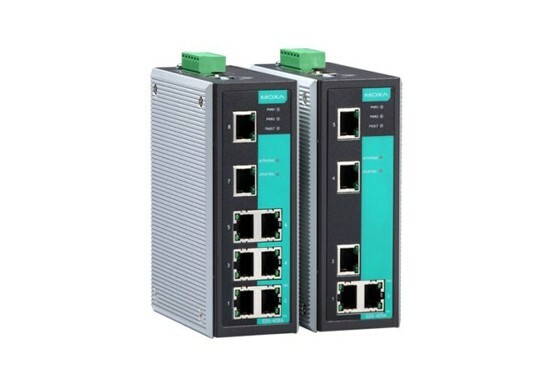 The EDS-405A-EIP and EDS-408A-EIP are 5 and 8-port managed industrial Ethernet switches with EtherNet/IP enabled. With Ethernet/IP embedded, the EIP switches are visible with custom faceplate in FactoryTalk® View for greater operational and network visibility in factory automation HMIs. EtherNet/IP EDS (Electronic Data Sheet) file, custom AOI (Add-On Instructions) and FactoryTalk® View faceplate are available for seamless integration. 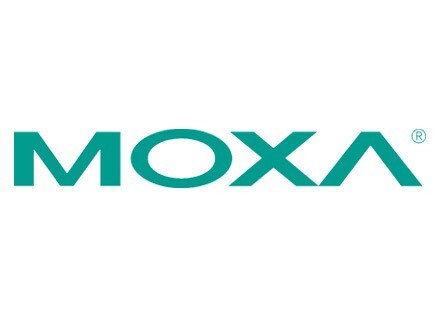 Improve performance, increase reliability and warranty and save money by utilizing Moxa. The EDS-405A/408A-EIP supports a variety of useful management functions, such as IGMP snooping, IEEE 802.1Q VLAN, QoS, port mirroring, SNMP, bandwidth management and warning by email or relay. 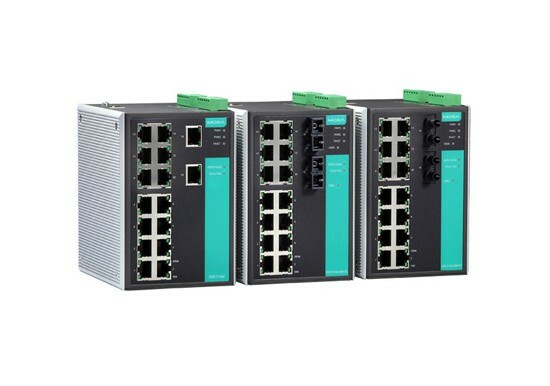 The EDS-405A/408A-PN are 5 and 8-port managed Ethernet switches with PROFINET enabled. With embedded PROFINET, the -PN switches can be easily integrated into the Simatic Step 7 engineering tool, a convenient way for automation engineers to configure and monitor with automation HMIs. 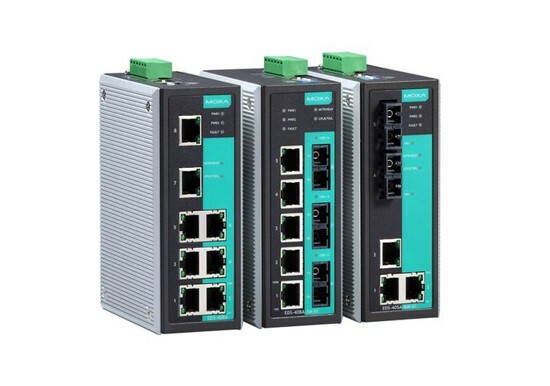 The EDS-405A/408A-PN switches with fast booting, Turbo Ring and Turbo Chain fast-recovery technology, can optimize PROFINET network performance. 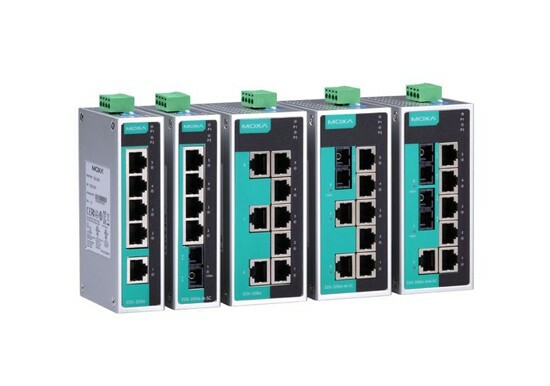 Moxa’s PROFINET switches also support a variety of useful management functions, such as IGMP snooping, IEEE 802.1Q VLAN, QoS, port mirroring, SNMP, bandwidth management, and warning by email or relay.